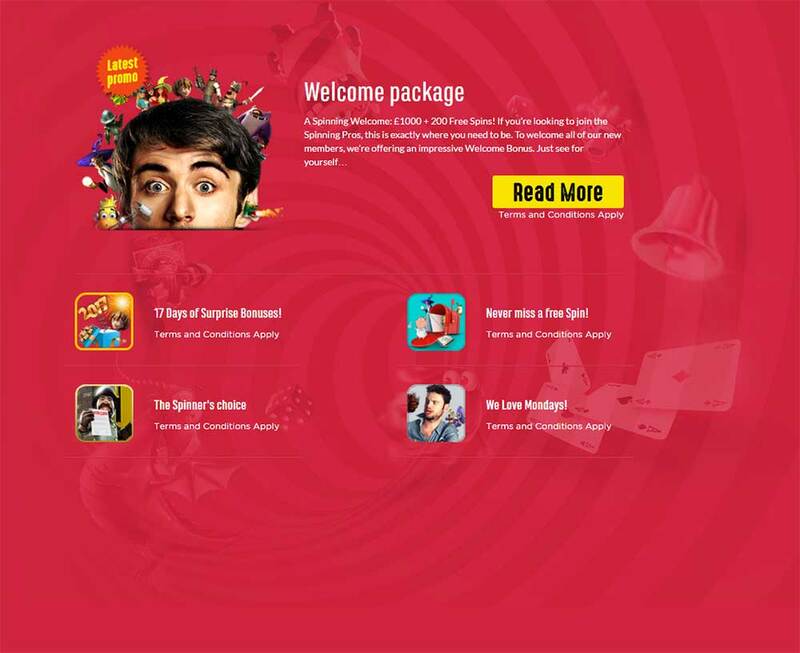 Spinit Casino Review – Big Bonuses on offer! Spinit Casino has been added to our list of recommended online casinos, this is a fairly new casino launched in 2016 but comes from the same group of people that are behind the popular Casino Cruise brand and as such shares the same UK gambling license. With a tagline of Spin It, Dare to Win It, they offer a massive range of online slots, table games and live casino games that total well over 1200 different titles, for new players they also offer a huge set of welcome bonuses that total a massive £1000 in casino bonuses and 200 Free Spins. Being part of the same group as Casino Cruise means that from the offset Spinit Casino is able to offer players a massive selection of slots and games from big name providers such as NetEnt, Microgaming, Nextgen, ELK Studios, Play’N GO, Thunderkick and many more. Spinit Casino not only has a UKGC (UK Gambling Commission) License but also an MGA (Malta Gaming Authority) license which is shared with just Casino Cruise, this means you can rest assured that you will be playing at a safe and fair online casino. 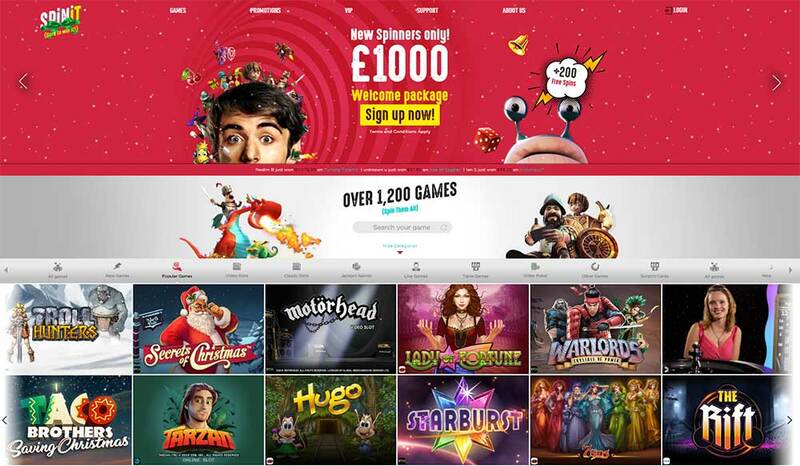 Welcome Bonuses of £1000 and 200 Free Spins! Over 1200 online slots and games on offer! Spinit Casino offers new players a total welcome package that comprises of £1000 in casino bonuses and 200 Free Spins, this is shared over your first 4 deposits at the casino and the bonuses all come with a 40x bonus wagering requirement. The 200 Free Spins are available for the Starburst slot and are given to players as 20 Free Spins spread over 10 consecutive days from making your first deposit, so make sure to keep logging in daily to play your freee spins. It’s worth noting that deposits made using either Skrill or Neteller are not eligible for the welcome offer! Spinit Casino already has quite a decent promotions section running for existing players that include offers such as free spins, reload bonuses, and bonus codes so once you have made use of the welcome bonuses be sure to check the promotions section to see what is currently on offer. Spinit Casino has a wealth of different support options on offer all contained within a separate Support section on the website, live chat should be the main focus if you are looking to get an issue resolved quickly along with a comprehensive FAQ section that covers most of the basic casino questions, along with theses contact methods there is also an email option for sending in KYC documents and telephone support on offer for various countries. Spinit Casino has a huge array of deposit and withdrawals methods that include Visa, Mastercard, Entercash, Trustly, Zimpler, Euteller, Skrill and Neteller. As mentioned earlier – Deposits made via Skrill or Neteller are not eligible for the welcome offer, and we would suggest double checking for any of the e-wallet deposit options if you are taking up the welcome bonuses. Spinit Casino offers players a massive range of online slots along with a very decent welcome bonus package and reasonable wagering requirements, and sharing a license with just Casino Cruise is definitely a plus. Whilst there aren’t any “special features” to the casino we expect that Spinit will focus quite heavily on bonuses and reloads and regular promotions just like Casino Cruise, so if you are a fan of regular reload bonuses then this casino is definitely worth checking out. The range of slots and filters is very decent, the search function updates in real time making it a breeze to search out your favourite online slots quickly, one thing we would like to see is a “filter by slot provider” but this is just mainly a personal preference.